Understanding the challenges of movement disorders can be difficult for others who have never experienced movement complications. Klick Inc. aims to increase the understanding of these challenges through their SymPulse™ technology. 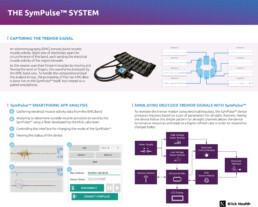 SymPulse™ uses an electromyography (EMG) band to convey a patient’s muscle activity to whoever is wearing the band. Using this technology, physicians, caregivers and loved ones can experience the patient’s tremors.